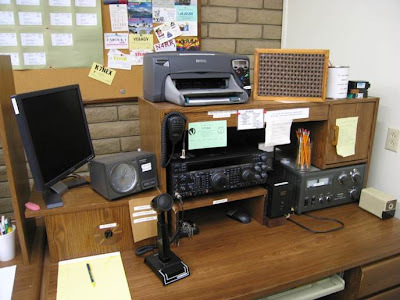 The Venture Out Amateur Radio Club is located at 5001 E. Main Street in Mesa, AZ. The club has a well equiped Ham Shack and offers Ham Radio Classes and Testing. Come and join the group at 10:00 a.m. on Saturday in the Oasis building at Venture Out during the winter months. We have a 50/50 pot and there is a program for most of the meetings. It is a fun loving group. We look forward to seeing you there!!! Everyone is welcome. You do not need to be a Venture Out resident to join in the fun. In the summer months the group meets for a gab-fest at the VO center at 10:00 a.m. on Saturdays. The VO Hams provide traffic and parking assistance for the VO Fall Classic Tennis Tournament. The 2016 Fall Classic will begin on Oct 31st and run until Sept. 5th. Bring your 2 meter HT and help out. As a reminder the Sunlife ARC meets at 10:00 a.m. on Monday mornings all winter. This is a fairly large group of experienced Hams. The programs are great! Come and enjoy!! See the Sunlife link for more information. Unless otherwise specified, all rights reserved © 2013 Venture Out Electronics Amateur Radio Club. Club and logos remain their property and are used solely to represent them.